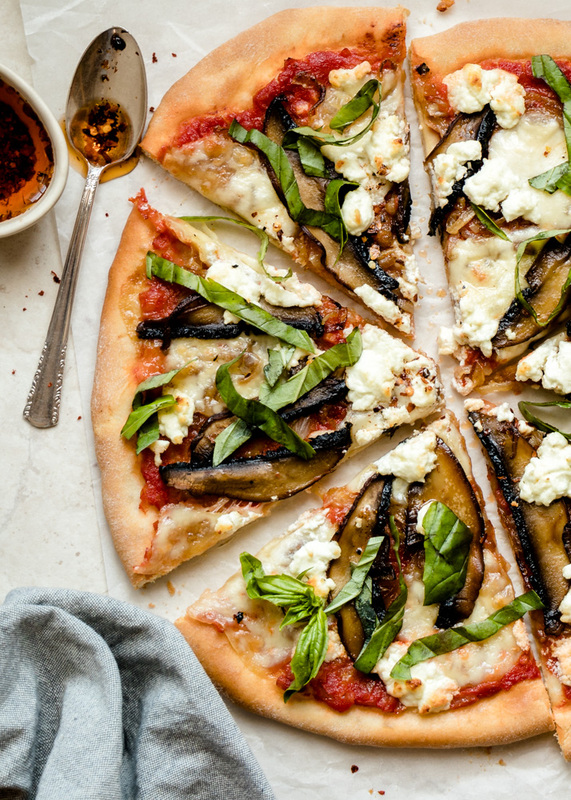 Rolling into Sunday with this delicious Caramelized Onion, Portobello Mushroom & Goats Cheese Pizza. 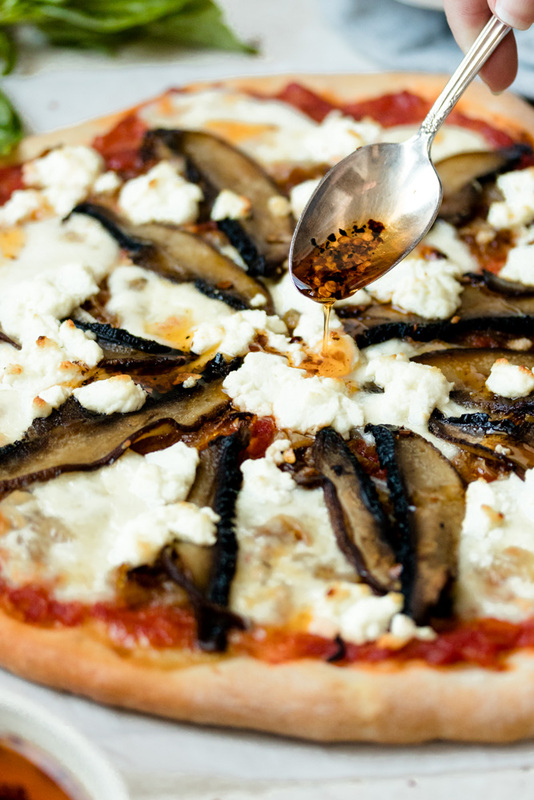 Weekends were made for pizza, but we’re of the mind that they are welcome any day of the week. And this one is certainly a winner. 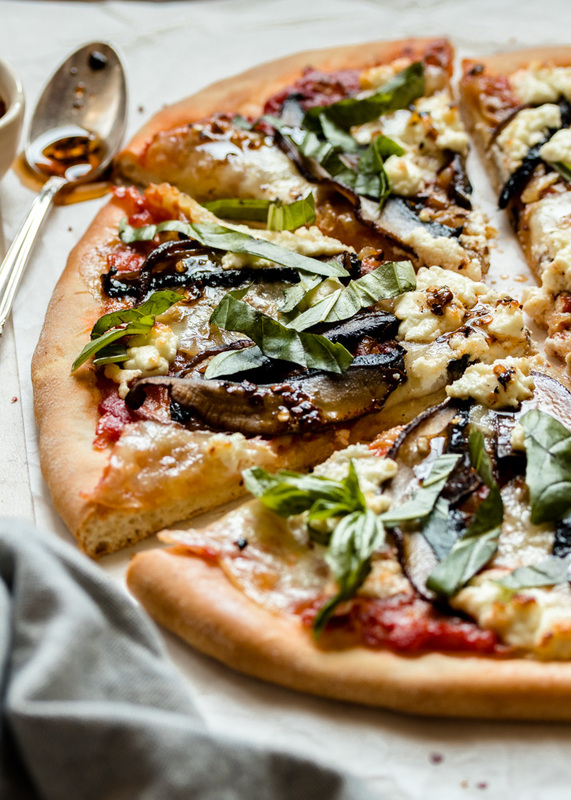 It’s got sweet slowly caramelized onions, fresh mozzarella and tangy goats cheese, pan seared mushrooms, and after it comes out of the oven, is topped with fresh basil and a hot chili oil. Unreal if you ask us. Speaking of unreal, Spring is finally here!! We are on the last day of March and are getting some warmer days. It’s ten degrees Celsius here today. The snow is slowly melting, leaving behind some nasty looking sand covered snow banks. But that’s alright with us, cause it just means green grass, flowers and leaves on trees are not far away. Hoping the warm weather trend stays and we don’t get another cold blast of weather, but this is Newfoundland after-all, and we always have an April storm. Time will tell…but let’s get back to this pizza. 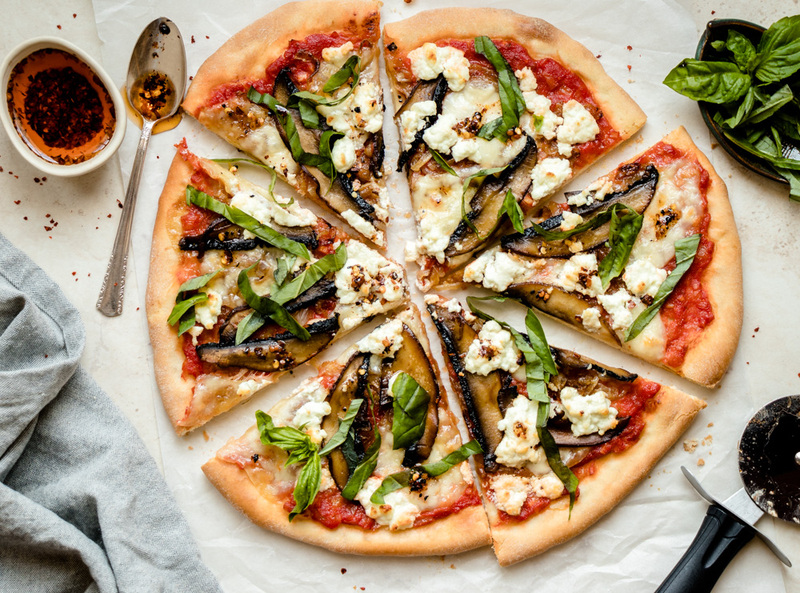 Inspired by a pizza we had at The Cove in Steady Brook, we nixed the spicy salami and created a vegetarian version instead. We used our usual pizza dough and basically used our fresh tomato pizza sauce recipe, except we didn’t have any good fresh tomatoes, so we subbed it for some jarred passata (strained tomatoes from Italy), which is a touch sweeter than regular tomato sauce. Just add the most of bottle when you do the fresh tomatoes and you’ll have a lovely pizza sauce. We also made our own chili oil, but feel free to use store bought. If making your own, be sure the hot red pepper flakes are not old, or the oil will not take on their heat or colour. 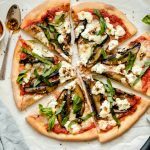 A sweet and tangy vegetarian pizza, with a touch of heat from a homemade hot chilli oil. Recipe is for one 12″ pizza. Place a pizza stone on the lowest rack in the oven and preheat to 450F. Meanwhile, heat 1 tbsp butter and 1 tbsp olive oil in a large frying pan over low heat. Add the onions and cook slowly, stirring frequently, until the onions are soft and caramelized, about 20-30 minutes. In a separate pan, heat another tbsp of olive oil over medium high heat. Add the sliced portobello mushrooms and let fry untouched until golden brown, flip and cook the other side as well, about 6 minutes total fry time. Remove to a plate until ready to assemble pizza. Make your chili oil by adding 1/4 cup olive oil to a small pot with 1 tbsp of hot red pepper flakes. Make sure your pepper flakes are new and not old. Heat over medium low heat, so that the oil shimmers, but does not boil, for about 5 minutes, remove from heat and transfer to a sealable glass jar. Will keep in he fridge for 3 months. Roll out your pizza dough, until you have a 12″ round shape. 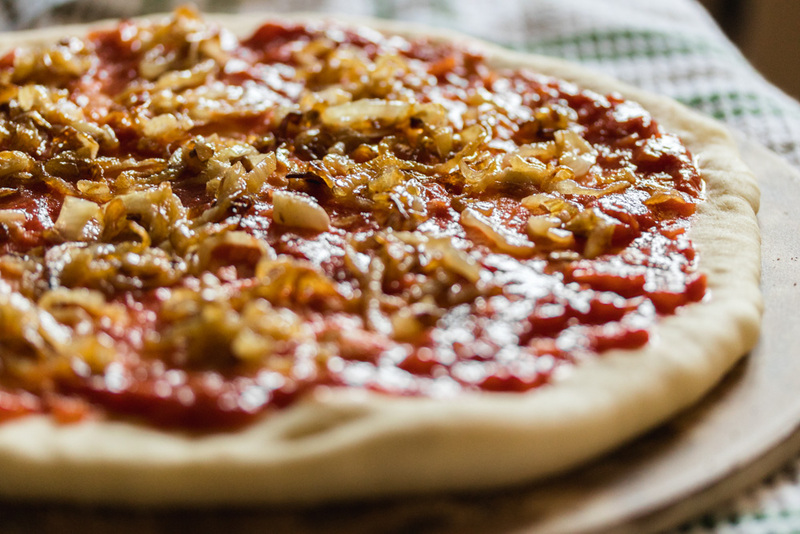 Have all of your ingredients ready and by the stove, so you can assemble the pizza quickly. Remove the stone from the oven and sprinkle with cornmeal. 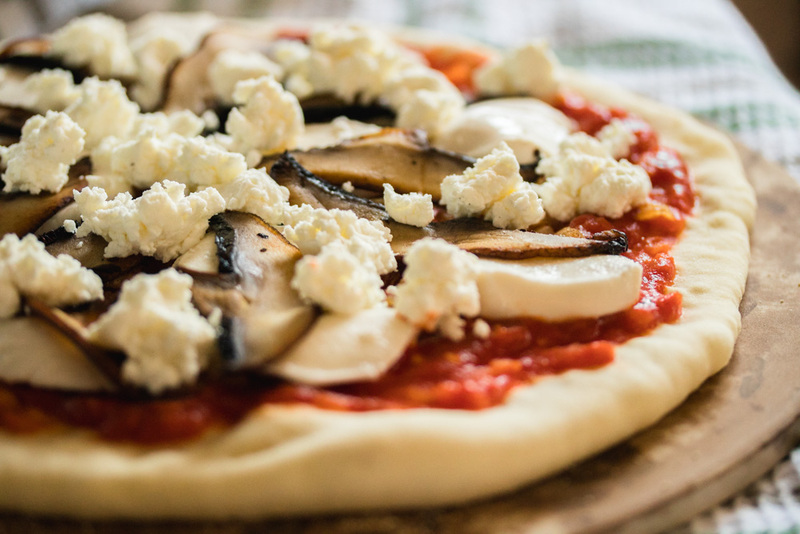 Add the pizza dough, and quickly add your toppings in this order: pizza sauce, caramelized onions, fresh mozzarella, mushrooms and finally goats cheese. Return to oven. Cook for 11-12 minutes, until pizza dough is cooked through and cheese is just starting to brown. Remove from oven and drizzle with hot chili oil and top with basil leaves. Slice and serve immediately. Thank you, Sarah! We love it and hope you do too!